Our freshman class president, Frankie Carrasco-Passafiume, ready to rock. Photo by Mrs. Reinbold. Most schools from kindergarten all the way up through high school host a week of spirit filled with various activities and themed dress days, and students are encouraged to spread school spirit by participating actively throughout the week. Rosary Academy held theirs last week, and Royals of all grade levels displayed great amounts of enthusiasm as the week went on. Monday was dedicated to Red and Gold Spirit Dress. Students were able to dress in their most extravagant Red and Gold attire. It was quite a sight to see everyone in their spirit wear, with memories of red and gold flashing through everyone’s minds. 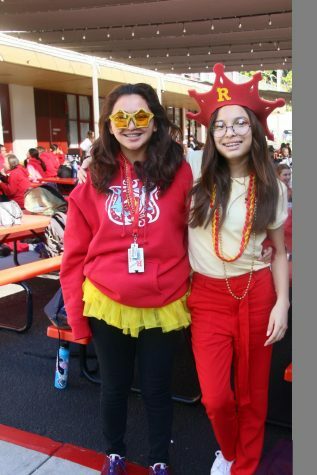 Sophomore Sandra Ragle says, “It was a fun-filled day where everyone dressed abundantly in Red and Gold finale apparel, and I really enjoyed it because it made me remember how amazing Red and Gold is, and I’m really excited to the start of this season.” There was also an exciting student-versus-faculty dodge-ball game at lunch where all members of the Rosary community were welcome to compete. On Tuesday, students were able to “twin” with their big or little sister. 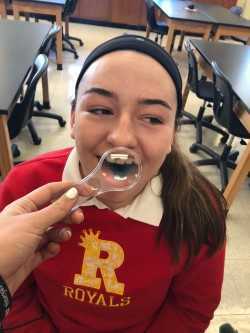 Rosary has a program where seniors and sophomores, and juniors and freshmen are paired up as “sisters” within their house. It was very cool to see so many Royals participate, as it gave students of differing grade levels the opportunity to bond and connect with one another by dressing in similar attire. Next, it was Throwback Thursday. Students were able to travel back to the ’80s. Many students had very vibrant choices of apparel, with neon leggings, multicolored scrunchies, and big hair. Other Royals took the more mild route, with trendy jackets and jeans. All around, Throwback Thursday was totally rad. On Friday, Royals were able to wear their class colors, as most students participated in the cherished Rosary tradition, Clash of the Classes. Basically, it’s a precursor to Red and Gold, where all four grade levels compete against one another in various forms of entertainment. There’s often lots of music, scripts, and dances that each class puts together over a few weeks leading up to the event. To learn more, take a look at the Royal Reporter’s Clash of the Classes article. This year, the senior class took the win, with the freshman holding second place. It was an exciting day filled with lots of school spirit and anticipation for this year’s Red and Gold to come. All in all, it was a fun-filled week of dress days and activities that undoubtedly brought school spirit to a remarkable high. Rosary Basketball Wins the CIF Southern California Championship!